Lennie plays second clarinet in the school orchestra and has always happily been second fiddle to her charismatic older sister, Bailey. Then Bailey dies suddenly, and Lennie is left at sea without her anchor. Overcome by emotion, Lennie soon finds herself torn between two boys: Bailey's boyfriend, Toby, and Joe, the charming and musically gifted new boy in town. While Toby can't see her without seeing Bailey and Joe sees her only for herself, each offers Lennie something she desperately needs. But ultimately, it's up to Lennie to find her own way toward what she really needs-without Bailey. A remarkable debut novel perfect for fans of Sarah Dessen, Deb Caletti, and Francesca Lia Block. 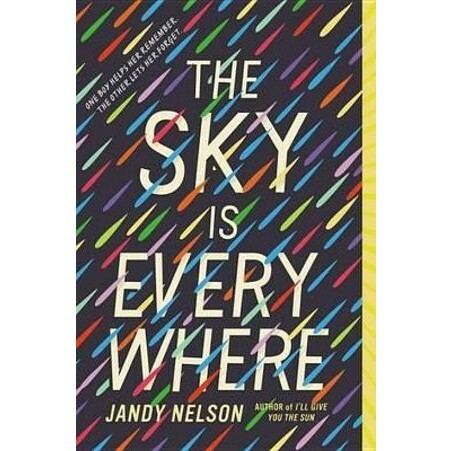 Jandy Nelson can't seem to stay out of education; she has a BA from Cornell, an MFA in poetry from Brown, and another MFA in writing for children and young adults from Vermont College of Fine Arts. She lives in San Francisco, where she, much like Lennie, divides her time between her proper tree and running loose through the park. Jandy is a literary agent, a published poet, and a devout romantic. She's madly in love with California, how it teeters on the edge of the continent. The Sky is Everywhere is her first novel.